The transformative power of in-store mobility on the transaction experience is clear: untethering sales staff from fixed POS stands brings flexibility and enhances the customer experience. Yet despite retailer appetite for mobile solutions, widespread deployment is yet to be seen on the high street. 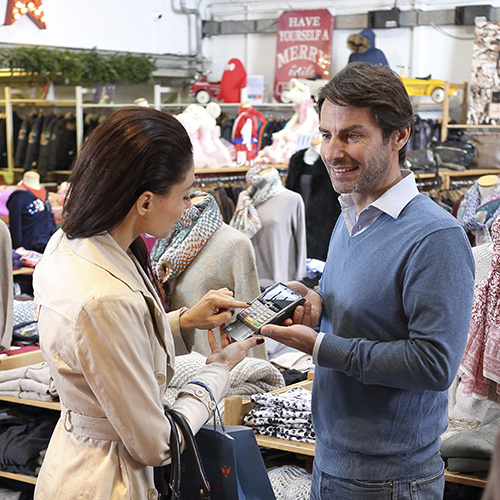 In-store mobility allows any salesperson to take payment, anywhere in the store. It has revolutionary potential but it’s far from new: Apple, perhaps the best-known example, launched its revamped retail solution about ten years ago with great success globally. Yet paradoxically, despite the appeal of in-store mobility to retailers, deployment isn’t seen in-store at significant scale and most consumers continue to pay at a very standard cash register. Michael Amsellem, Director of Product Management in Ingenico’s Retail Enterprise department, tells us why there are not more mobile checkout solutions, and explains the continued appeal for retailers despite a slow start. When did in-store mobility first emerge? It emerged about ten years ago in two forms. The first was a handful of big brands who wanted to transform the shopping experience by removing traditional checkouts. The other was m-POS, which was more dedicated to SMEs and micro-merchants, and meant anyone with a smartphone could become a merchant. Both started at the same time but while m-POS has exploded, there have been relatively few deployments for large retailers. What are the benefits of in-store mobility? Queue-busting is one. In an age when you can buy things at a click of a button, consumers are less patient and won’t wait. Devices connected to the Internet also allow you to sell more products – the endless aisle concept – whether they are in- or out-of-stock, which avoids missed sales. Removing fixed tills means retailers gain valuable square metres, which is particularly important given the trend for small, city centre outlets. Floor space there is expensive so most prefer to display products or offer an in-store experience over a fixed POS. Importantly, it empowers the salesperson. Today, you can find so much information online before entering the store that the sales person is at a disadvantage. You need them to be as informed as the customer in front of them. Mobility is a way of re-arming salespeople, giving them access to information so they can answer any question, immediately check stock levels and offer a more personal service. Why hasn’t it become mainstream? There have been various reasons why some initiatives haven’t been successful. One is the technology, which is probably only now up to the necessary standards in terms of pairing, weight, battery life, easy charging, connectivity and seamless integration with the existing POS system. Additionally, some retailers found the cost of the early technology, such as from giving a tablet to each salesperson, was not compensated by the additional sales made. Secondly, people engagement was underestimated. Training of salespeople is crucial, as not all staff are as tech savvy as those in Apple Stores. Plus, sales staff know their products very well, but they are less familiar with payment questions – tax payable on luxury goods, for example. Then there’s the logistics of reorganizing the store. Replacing cash registers with mobility devices is easy, but how do you deal with anti-theft measures? Where do you keep the bags? How do you print a receipt? Where do you leave the tablet when you don’t need it? All these have previously been resolved by a fixed point of sale, so retailers need to entirely rethink how the store is organized. At Ingenico we’ve learnt from all these experiences, and new implementations are far more successful. Why is in-store mobility still at the top of retailers’ agendas? There’s a gap between in-store and online shopping. Online, you have an infinite choice of products available 24 hours, alongside accessible advice. However, you don’t have product immediacy, you don’t have a direct relationship, and you can’t touch the product. Stores are still relevant, so bricks-and-mortar retailers are turning to in-store mobility, merging the best of both worlds by providing staff with all the online information they need. Being able to offer the same level of customer service in-store as consumers get online is the challenge of retailers today, often called “store digitalization”. Click & Collect, endless catalogue, home delivery, recommended products, 1-click payment are services that need to be offered in-store. In-store mobility is one means among others to deliver the promise. Could you share some use cases where mobility has been implemented and successful? Mobility interests all market segments and businesses. We work with airlines, which uses our solution to sell new services at the airport, such as seat upgrades and extra meals, while fashion brands use a mobile solution to check stocks. Consumer electronics stores use tablets primarily to counteract “showrooming” and secondly for line busting mainly during peak times. One hotel corporation personalizes the check-in experience for their guests and uses our m-POS solutions to implement a “no front desk” lobby floor plan so staff can better interact with customers. One sports retail company uses our devices to reduce the number of customers that abandon their items. In terms of form factors, what trends do you see emerging? The one-size-fits-all approach is limited but there are broadly two schools: an all-in-one device versus two devices. The all-in-one is better for payments and queue busting, and retailers typically have the same kinds of requests: a small unit with good battery life, easy pairing and a multi-charger cradle so they can charge multiple devices at once. For an endless aisle approach, two devices (often a tablet and an Electronic Funds Transfer POS) is better as it allows customers to self-serve and pay. Here we find retailers opting for larger, fixed screens. What are your recommendations for a successful mobility project? Test and learn: fail fast so you can work out the best solution for your business. Training is very important so that staff are aligned with what you want to achieve. Make sure your WiFi coverage is strong. Organize your store, and go for online receipts, which has the added advantage of building a CRM for targeted marketing in the future.